What better way to give your pet the freedom she deserves than with this PetSafe 4-Way Locking Pet Door? This door is generously sized for dogs and cats up to 25 pounds. Perfect for cats and small dogs too! The four-way security lock allows you to choose between four options—in-only access, out-only access, open and locked. Plus, the 7 1/8” x 7 ½” rigid flap opening features a frosted, see-through design and a magnetic closure, so the door stays securely shut when not in use. This pet door keeps unwanted visitors out and gives you complete control over where your favorite family member goes! The easy do-it-yourself installation allows you to customize the height of the door to your favorite furry companion. 4-way lock design allows you to choose in-only access, out-only access, open and locked. 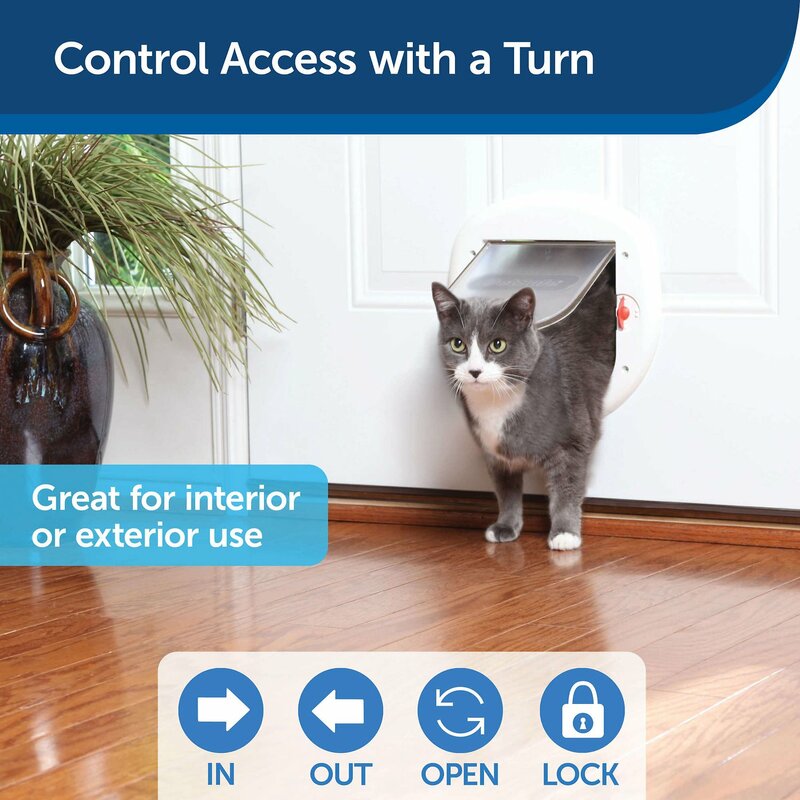 Fits both interior and exterior doors, walls and windows, so you can give your pet access wherever you choose. 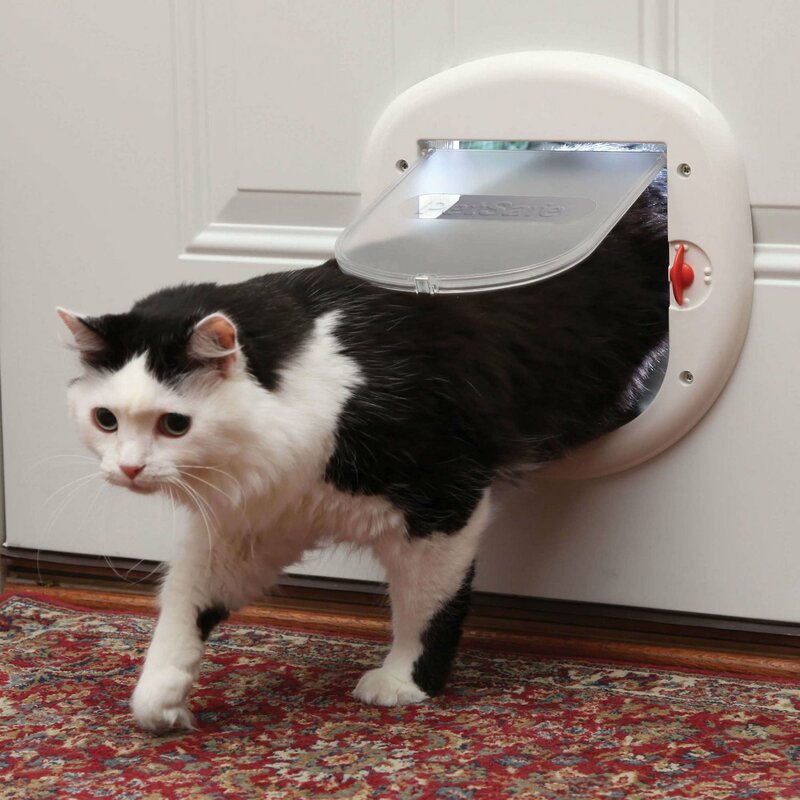 This plus-sized pet door is specially designed for cats up to 25 lbs. and is also suitable for small dogs too. The durable plastic flap is designed with a see-through, frosted window and a magnetic closure. I put this on a storage tote and put my cat’s litter maid litter box inside the box. It worked great! Except he would lock himself in or out. So I removed the locks. Very user friendly for my use. Why can't I replace the just the 'flap'? The door works perfect for my 2 cats, however one of the cats broke through the flap during a bad snow storm and now I find I have to install the entire combination. Bought this bigger door to replace smaller one that broke. Since bigger, had to make a few backdoor cut adjustments. Relatively easy to install after that. 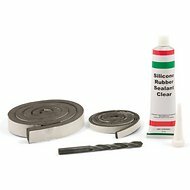 Great price & easy to use. Both knobs seemed like they could break upon turning, but so far so good. Hope I get a good 6+ years use out of this as I did the last one. no extension for this cat door! be warned! Don't be fooled. There is no extension for this door. We have a hole cut in the outer wall of our house and now are scrambling to figure out how we will create a tunnel ourselves! Looks great on our door; Bonnie using it with ease. The only issue was with kitty not wanting to be measured lol We resolved that by measuring something she stood next to and seeing where she was against it :) A very nice door - the magnet is a bit strong though so we will be removing that for easier operation. Worth the money...for a while. I purchased 2 of these "cat" doors as replacements because my old ones had broken flaps. These doors are for my Yorkies. One 16 lbs and my daughter's beagle is 20 lbs. They can go through with no problems.The only drawback is that the flap does tend to break. After a few years with duct tape on one and a homemade leather flap on the other I replaced the whole door....BECAUSE you cannot buy a replacement flap. Who would make an item like this and not have replacement flaps??? The size and shape of my doors would not permit the use of a regular small dog door. This cat door is made well and easily installs.It accommodates my biggest boy who is over 20 pounds.